In this picture the bride's dad is giving her away to her groom. With one last big hug from dad and all the smiling guest looking on with joy. The Firehouse Restaurant is one the top wedding and event venue in the greater Sacramento area and in historical Old Town Sacramento. The building dates back to 1853 and was purchased and remolded back in 1959. With the restaurant opening in 1960 and still in operation today for dining and special events. It’s one of the most famous restaurants in all of Sacramento. The back courtyard and lower half of the restaurant is where all the wedding events will take place. The ceremonies are held in a red brick walled off courtyard that has gorgeous ivy growing all over it. It reminds me of something you would see in New Orleans, not Sacramento. The 4,000 square foot courtyard is big enough to hold events of all sizes. The Courtyard grill is the indoor part of the wedding and event center. It can hold smaller weddings and receptions. Venue, The Firehouse Restaurant 1112 2nd St, Sacramento, CA 95814. Wedding Officiant, Cindie Wilding Bird & Nest Ceremonies Rocklin, CA. Ceremony Music by Ryan Hernandez Music, Sacramento CA. DJ & Lights by, DJ Dan Utica, 829 W Union Ave, Modesto, CA 95356. Flowers and arrangements by Ambience Floral, 1249 Pleasant Grove Blvd #100, Roseville, CA 95678. Videography by Reel to Real Video, West Sacramento CA. 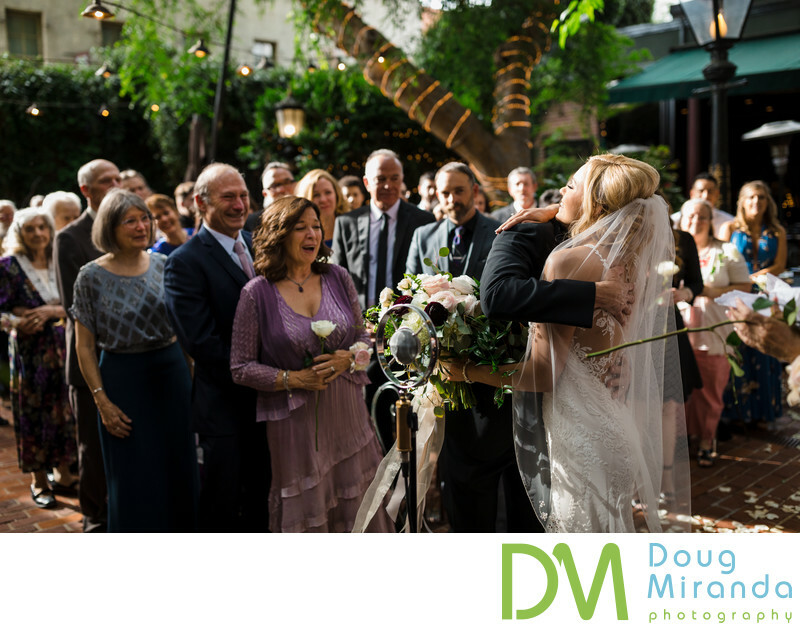 Photographer, Doug Miranda Photography 1017 L St #791, Sacramento, CA 95814. Location: 1112 2nd St, Sacramento, CA 95814. Keywords: The Firehouse Restaurant Sacramento (30).